Looking at the Luminus SFT-10 Cg or SFT-20 CG (if I can find them) to build a light with a tight beam and as little spill as possible. I see that typically a smaller die helps throwers, but being I’m looking at an Aspheric I’m wondering if the 2x output of the 2mm die would be better than the lower powered, but smaller, emitter. For testing I will probably use the Uniquefire Uf-t20. Don’t in any way need the zoomie but that looks to be a good (cheap) host for a tight beam. Osram has some better high intensity options if all you want is green light. Do they? Excellent. I tried looking but had a heck of a time understanding their led structure/product lines. I hate to ask, but might you be willing to help a fellow out and offer a link? I can’t seem to even get started understanding the Osram lines. I apparently never said thank you, so thank you. I had spent quite a few returning trips to OSRAMs site and just today I noticed something different. Apparently they now have a “white flat” in green! If my reading of the spec sheet is correct this thing is a beast. The highest bin pushes over 500 lument at 1 amp, specced to over 3amps (2.5x base lumens) and if how hard the regular white flat can be over driven the max output of this 1.06mm2 emitter could be over 1500 lumens. That’s a bit more then my 2amp Xpe2, which is already fairly awesome. Yup, green light is the most visible to the eye, and since light measurement equipment is made to simulate the eye’s response then pure green light gives the highest efficiency and lumen numbers. 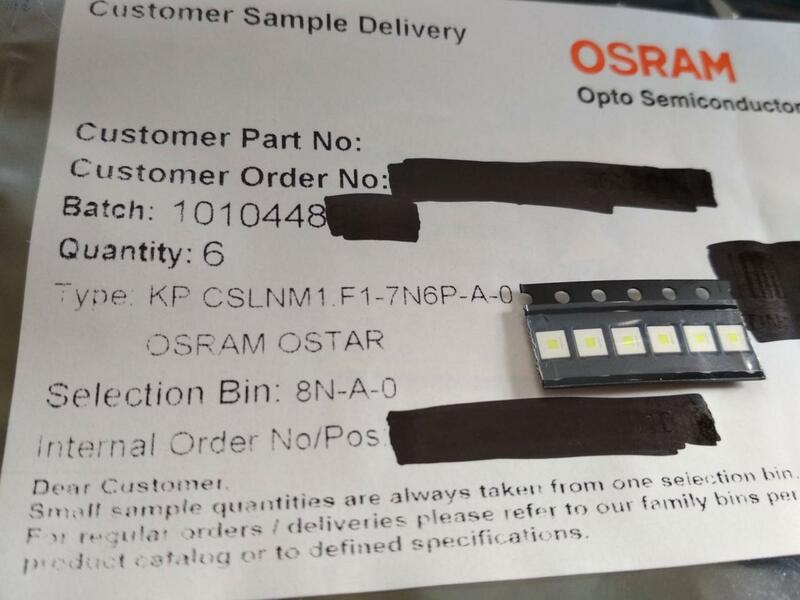 That green Osram LED is actually phosphor converted green,similar to Luxeon rebel lime, that's why is so efficient, it still uses efficient blue chip. Real green LEDs have lower lm/W despite the higher human sensitivity to green because "green" chips have very low efficiency compared to blue ones. That's why it makes sense to make phosphor converted green LEDs. Do we have some kind of MCPCB for the KP CSLNM1.F1? 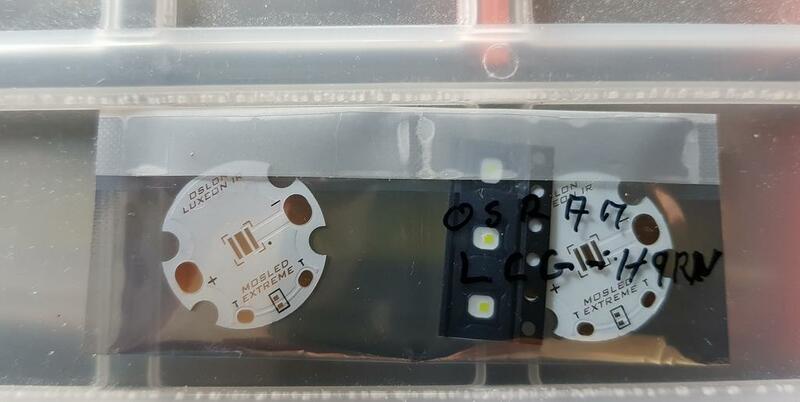 And i have 3 of the Osram LCG H9RN (https://www.mouser.de/ProductDetail/720-LCGH9RNMXNX1) with ledboards from Led4Power here. But i have not had the time to test them. Hope i will get to them in the near future. Check out the white flat thread (CSLNM1.tg). I believe the white flat can be use on a Cree board, and the white flat is much easier to use (then the black flat) since it has the neutral center contact. I believe the board you show will also work for this LED. OSRAM was very kind to me. I’m guessing this was a sample request? Good on you! One is probably going to end up in a SMO C8. Hard to tell if it’s a downside for lighting use – due to the phosphor conversion it’s more of a light green, maybe lime. It has a rather broad spectrum going all the way into red. Which means there’s some color rendition, it’s like it can’t decide whether it’s green or VERY VERY off-white . Far from “pure” green, but very bright. Nice. What flashlight and LED is that? UF-T20? Yes, Ultrafire UF-T20, good eye. Led is a Cree XP-E2 in green. Driver is from Mountain Electronics, just their cheap 1 amp single mode driver, with the 2 amp upgrade of course! It’s perfect actually as the E2 maxes out right around 2 amps. That said, the E2 (very small die) puts out say 350 lumens at 2 amps, the CSLNM1.F1 is WAY more than that! Full disclosure, that was in dense blowing snow, it was FAR brighter in that condition. For a zoom lamp take a look at the 90° viewing angle version of the Luminus SST-10-G. More powerful than the Osram and 3535 footprint. I used the scotopic conversion factor, not the photopic. Why is there no database for this stuff? Luminus SST-10-G has 958 mW = 564 lm at 1.5 A.
Osram KP CSLNM1.F1 has 640 lm at 1.5 A but is spec’ed up to 1120 lm at 3 A. Plus the SST-10-G’s typical forward voltage at max current is 4.3 V.
KP has 3.32 V. Another advantage of a wide spectrum. Assuming peak bin performance that SST is a beast. Best case performance is 1200 lumens in a non converted color! I’m running an XP-E2 that maxes at 400 some lumens and even losing a bunch in a zoomie it is quite powerful. I can see 190 mW as minimum flux for the lowest bin, but not lumens? I made the mistake of thinking it was lumens at first as well, it wasn’t until your comment that I realized it. Since the light put out is visible I am surprised it is not measured in lumens. I guess it is possible to convert, but its not as simple as a one to one value comparison. For monochromatic light (one main frequency) use the conversion factor of the lower curve here. Only lasers are monochromatic, this is not a laser. You need to look at the lumen numbers not mW. The lumens are on the datasheet if you look for it. Only lasers are monochromatic, this is not a laser. You need to look at the lumen numbers not mW. The lumens are on the datasheet if you look for it. 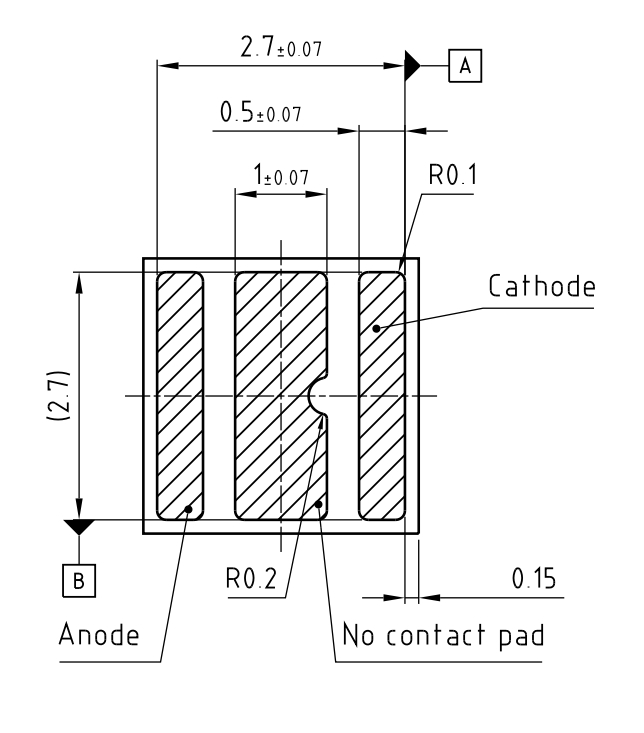 If you could provide the page number for the lumen measurement I would appreciate it. You state it it is there but you yourself stated 190, which min spec is 190 mW. that is not 190 Lumens. Here’s the CSLNM1 in a Cometa. Sadly no snow or rain right now. Beam divergence is in the order of 1.3 degrees (full angle). Some chromatic aberration on the fringes due to the broad spectrum. What host is that? Looks Aspheric but that is a small head for an 18650 Aspheric. 43.5mm lens diameter vs the UT-20’s 38mm and also longer FL so a tighter beam I think. I love it, looks like a dang laser beam! You need to look at the lumen numbers not mW. The lumens are on the datasheet if you look for it. And on that terrible disappointment, I’m afraid it’s time to end. The best part is the arrogant attitude in which the comment was delivered, but then it could never be backed up.